Summary (from Goodreads): Zach, Poppy, and Alice have been friends forever. And for almost as long, they’ve been playing one continuous, ever-changing game of pirates and thieves, mermaids and warriors. Ruling over all is the Great Queen, a bone-china doll cursing those who displease her. Poppy set down one of the mermaid dolls close to the stretch of asphalt road that represented the Blackest Sea. I loved reading creepy books when I was a kid – my shelf was full of Goosebumps and all its random ripoffs before I moved on to Point Horror and finally grown up stuff like Stephen King – I think it is safe to say that Doll Bones would have been quite at home on my shelf. Delightfully dark, it takes you on a quest to discover the truth behind a delicate bone china doll where the three main characters learn about themselves and each other and how the world works outside of their usual bubble. An imaginative trio who make up adventures for their collections of action figures and dolls, Zach, Poppy and Alice are best friends until Zach’s father throws away all of his action figures and can’t get them back. Zach tries to quit the game but something odd brings them back together. The china doll they call The Queen suddenly starts appearing in Poppy’s dreams as a real girl. A girl who claims the doll is made from her own bones and needs to be returned to her grave to be with her parents. Zach and Alice are dubious at first, Poppy is a willful character who probably wouldn’t be above making things up to get Zach back in the game but then Zach starts getting the dreams too and it all gets a bit too real. Fast paced and exciting, I raced through this novel without wanting to put it down. The characters were bold and funny and the settings were deep and real, told from the perspective of lost and freaked out almost-teenagers, making the whole thing totally immersive. 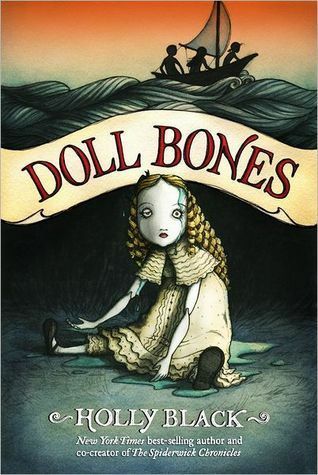 Interspersed with beautiful illustrations which added to the sinister story, Doll Bones is a wonderful example of how horror is for children too – it is scary and creepy but has enough comedy and a feel-good ending that it won’t leave anyone traumatised. Very satisfying and great fun to read as an adult, too. Ooooh, a new Holly Black book!